Doug Azaert grew up in Wilmington, North Carolina, and settled in the Adirondacks in 1982, teaching kayaking with some buddies. After a year or so, they realized that guiding rafters was more lucrative than teaching people how to paddle. Doug spoke of the early days of running the business with his friends. “The first two years they did all the guiding and I was just the chief cook and bottle-washer, and when I saw how much fun they were having, I knew I had to get in on that.” The third year, he had his guide’s license and joined the fun. That enterprise grew into Wild Waters Outdoor Center, a flourishing whitewater rafting business that also offers canoeing and kayaking. The business is headquartered at The Glen, a little settlement that spills over into Thurman, Johnsburg and Chestertown, where NY state route 28 crosses the Hudson. The business was first housed in an early 1900s hotel-turned-youth-hostel known as The Glen House. Doug worked from season to season, enjoying the experience, but not sure where it would lead him. “I think it was not until the tenth year that I stopped mentally asking myself each fall what I’d be doing the next year.” He had found his niche, and in the 1990s, on a blind date with a friend of one of his guides, he also found Aimee Paquin. Aimee explains that an old friend of hers, who guided for Doug, was soon to be married, and he and his bride-to-be had thought it would be nice if Doug had a date–Aimee–for their wedding. Well, it turned out that there was more than one wedding in Doug and Aimee’s future. In 1997 they married, and she became an active participant in the business. 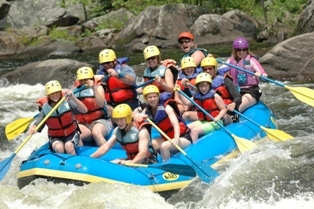 In the rafting business, safety is always the key issue, as guests are immediately made aware. Guides are all certified, having passed rigorous training and tests, not only in rafting, but also CPR and first aid. More than just guides, Doug’s employees have learned that their role involves entertaining the guests, telling stories, sharing history and passing along information about the area. In November 2000, fate forced a change. The Glen House burned to the ground. 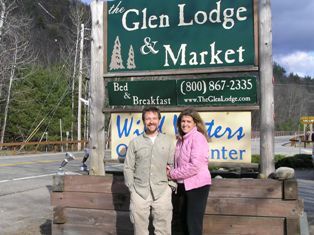 By the following summer, a new log structure had arisen from the ashes, to become The Glen Lodge and Market, a bed and breakfast with gift store, a business that was to become primarily Aimee’s. amenities its predecessor could not offer–features Aimee had learned were important to the changing tourist clientele. About sixty percent of the guests are Wild Waters clients, but the Lodge added a fourth season to the Azaerts’ offering, serving as a perfect haven for skiers after a day on the slopes or cross country trails. Fuel for the buses is just the tip of this green iceberg. From kitchen to bathroom, bedroom to market, The Glen Lodge’s household and laundry cleaning products are environmentally friendly, and recycling is a regular part of their day-to-day operation. Aimee says their customers–if they are aware–like the idea, and many of them comment that they would like to “green up” their own homes a bit. She feels she gave up no advantages making the change to green products. The Azaerts’ two sons, Brent, aged ten, and Weston, eight, help out with the businesses. Brent regularly sets the tables for breakfast and helps serve dinner. Both boys like to be around when the rafters are suiting up, making sure they have helmets, life jackets and booties. They are comfortable and poised way beyond their years, at ease talking with guests. It’s clear that both Aimee and Doug are “people people,” as well as entrepreneurs who understand the value of hard work and the importance of guarding the beautiful Adirondack environment in which they live. two historical novels, “Adirondack Gold,” and its sequel, “A Summer of Strangers,” both set in Thurman in the 1890s and presents programs for adults and kids. She hosts the Adirondack Mountain Writers’ Retreat, August 20-23, 2009. Learn more: www.PersisGranger.com.